Hofmann (HFM)’s plate heat exchangers play an irreplaceable role for the power plant energy-saving emission reduction. SDIC Anping Power Plant is a coal-fired power plant invested and constructed by SDIC Xiyang Energy Co., Ltd. The site is located in Xiyang County, Shanxi Province. Xiyang County is located in the eastern part of Shanxi Province, belonging to Jinzhong City, Shanxi Province where resources are rich. It is the national key coal-producing counties. As a result of Hofmann(HFM) in the power plant heat transfer has a wealth of experience and high-quality heat transfer technology and products, the project of circulating fluidized bed air-cooled unit selects Hofmann(HFM) heat exchanger. SDIC Xiyang Energy Co., Ltd. settled in Xiyang on December 31, 2004, intends to invest 2.16 billion yuan to carry out coal and electricity bundled development of Anping Power Plant, Huangyanhui ceremony was held in Beijing. June 19, Shanxi Province Trade and Industry Bureau issued a business license, which is the first Sino-foreign joint venture in Xiyang County and is also the first project of the Shente Company’s investment in China; and most important is the National Development and Investment Company’s first Chinese and foreign Joint venture project. The new 2 × 150MW coal gangue power plant officially started in May 18, 2006; two units were connected to power generation before October 1, 2007. The whole project has achieved the comprehensive utilization of resources and the purpose of green, with good economic and social benefits. This project uses three sets of all-welded plate heat exchangers and ancillary equipments provided by Hofmann(HFM), which provides one-stop heat transfer support for the 2 × 150MW circulating fluidized bed air cooling unit. The project plans to use superheated steam to heat hot net circulating water for heating purposes, and the implementation of this plan needs to use Hofmann's(HFM's) heat exchanger. Hofmann(HFM) provides heat exchange solution based on their efficient full-welded plate heat exchanger, to solve heating demand to further improve the thermal efficiency and reduce the area of heat-exchange equipment. 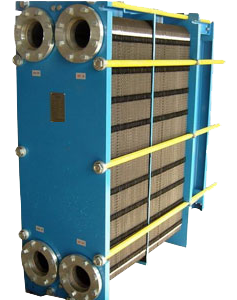 The use of superheated steam heating hot net circulating water for heating reduces the cold source loss of the steam. Increase the thermal efficiency of the power plant higher than the large condensing unit, so as to achieve the dual effect of energy saving. But to ensure to achieve this goal, it needs to make overall arrangement for urban planning and central heating area. Under the heat load fully guaranteed conditions, to determine a reasonable construction program can receive good comprehensive benefits.Hofmann's(HFM's) plate heat exchangers are able to meet this demand, and play an irreplaceable role for the power plant energy-saving emission reduction.